Facts about Plott Hound Dogs, "Scientific name for Plott Hound Dog, or domestic canine, is Canis lupus familiaris". The Plott Hound Dog is a pack hunting dog, which was bred in North Carolina to hunt and kill the bear and wild boar. In fact, today the Plott Hound Dog are still used as hunting dogs. The Plott Hound Dog exhibit unprecedented athleticism and strong sense of smell. The Plott Hound Dog have spilt character, but in the way, one would not be astonished. The Plott Hound Dog form excellent companion dogs and they can get along well with children. Plott Hound Dogs sweat glands are between their paw pads. 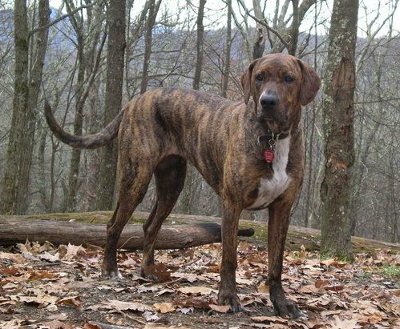 Plott Hound Dogs are generally a kind, bright, confident and courageous hound besides being loyal and reserved with strangers. Even though they are friendly to children and other family members, Plott Hound Dogs cannot be trusted with other home pets including other dogs. The Plott Hound Dog is self-minded dog who requires consistent training and guidance so that it doesn’t develop some sort of dominance. The Plott Hound Dog often drool and slobber. They need to be socialized while they are still young and calm, understanding and a good pack leader. Depending on the breed, the Plott Hound Dog can have either double or single coats. Otherwise, the coat is soft, glossy and smooth. The coat colors can be either any shade of brindle, black with brindle trim, brindle with black saddle or solid black. Sometimes, white patches can be spotted on their feet and chest. Out of all the coonhounds, the Plott Hound Dog is considered the most resistant breed. However, sometimes, they may suffer from gastric torsion and the fatal stomach twisting. This dog shouldn’t be exercised after a meal. Plott Hound Dogs can do best in apartments and he can live as long as 14 years. The dead hair should be removed occasionally while the ears and eyes should be regularly checked for infections. A Plott Hound Dog’s mouth can apply approximately 150 to 200 pounds of pressure per square inch and an American Pit Bull Terrier, German Shepherd Dog and a rottweiler can have 320 LBS of pressure on avg. When purchasing a Plott Hound Dog from a breeder, make sure to find a good breeder with references, check at least two to three of the puppies that were purchased from this breeder. The Plott Hound Dog resides in the Hound Dog Group and recognized in 2006 by the (AKC) American Kennel Club. Plott Hound Dog’s nose prints can be used to identify them, their nose prints are like a humans finger print. A Plott Hound Dog smells more than 1,000 times stronger than that of a human. A dog’s nose, secretes a thin layer of mucous that helps it absorb scent, after that they lick their noses and sample the scent through their mouth. A Plott Hound Dog is an omnivore, (definition-they eat both other animals and plants). All Dogs are direct descendants of wolves. The number one heath problems amongst Plott Hound Dogs is obesity, so always make sure your Plott Hound Dog doesn't get to fat. Many foot problems that Plott Hound Dogs have are just an issue of long toenails. Plott Hound Dogs pant to keep cool with 10 to 35 breaths per minute with an average of 24 breaths per minute. A large dog breed resting heart beats between 60 to 100 times per minute, and a small dog breed’s heart beats on average between 100 to 140 pant a lot. Plott Hound Dogs have two times the amount of ear muscles than people. A Plott Hound Dogs can hear a sound at four times the distance of a human. Sound frequency is measured in Hertz (Hz) Def-Hertz is the measurement of frequency, explicitly it's one cycle per second. The higher the Hertz are, the higher the pitched the sound is. Plott Hound Dogs hear best at 45,000 Hz to 65,000 Hz, while humans hear best at around 20 Hz to 20,000 Hz.